Famed private club for magicians and those who support the art of magic. Situated on a hill just one block from the legendary Chinese Theater this restored old 1909 mansion has become a Mecca for magicians and celebrities through out the world. YUSA's own Milt Larsen is the Founder of the 10 million dollar Magic Castle, and he is also the creator of the famous Magic Show at Caesar's Palace in Las Vegas. He still appears regularly on The Las Vegas Strip performing Magic shows. Milt's name is a familiar sight in the credits of most of the Walt Disney Movies, after he perfected the special effects for such great films as "Bed Knobs & Broomsticks". Milt also has one of the nation's largest collections of vintage phonograph records; which contains many rare selections dating back to the late 1800's. David Berger (who for many years was in charge of security for Frank Sinatra) is an accomplished magician in his own right. He was once the opening act for Liberace. Milt and David team-up daily on YUSA's Tape #3, as they present many one of a kind vintage recordings on "The Music Museum". CLICK HERE for info on how to support Yesterday USA. 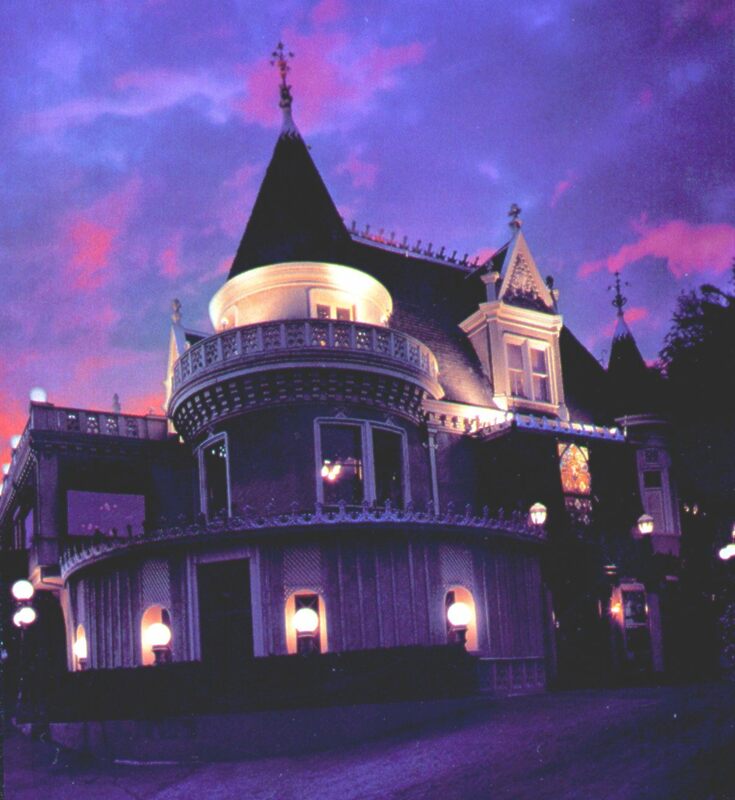 Check out the other great pictures of the Magic Castle that are displayed below, and CLICK HERE to visit The Official Magic Castle Web Site! The members and guests of this unique private club for magicians enjoy performances by the world's top illusionists and slight of hand artists in the Palace of Mystery. 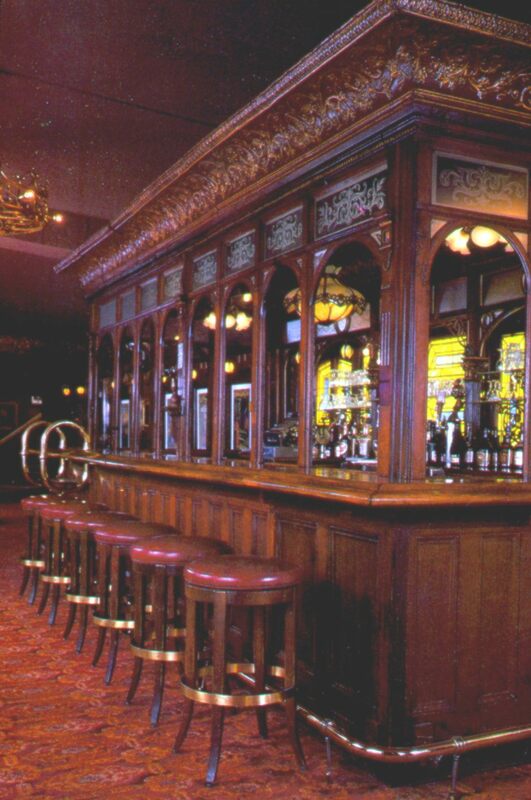 The "Palace Bar" is an ingenious combination of an old British Pub, some church windows, a firehouse ceiling and the birds-eye maple flooring from Hollywood High School. 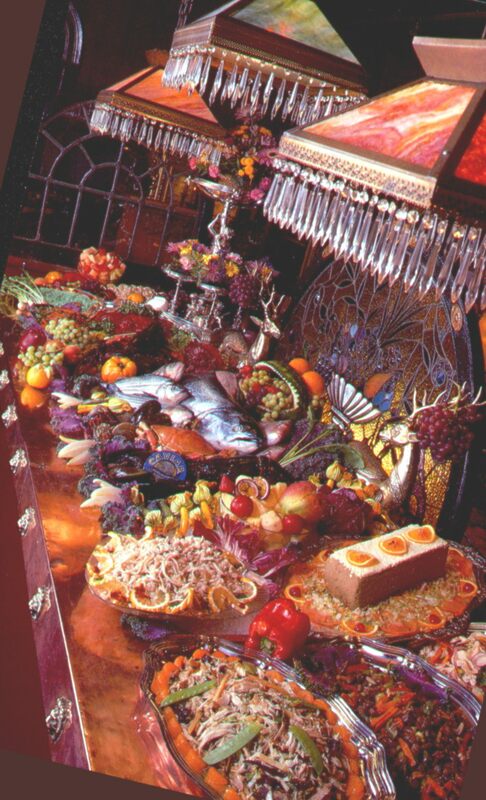 The Magic Castle introduced the word "FEATS-BOARD tm " to the dining world. Not just a salad bar, but a full array of exotic salads, fresh fruits and appetizers for you to chose from before your white-gloved butler attends to the entree of the evening. A magical dining experience in the world's first and most famous private club for magicians.